Place potatoes in 3 1/2- to 4-quart slow cooker. Coat beef with flour; place on potatoes. Arrange carrots around beef. Pour salsa over all. Cover and cook on low heat setting 8 to 10 hours. Remove beef from cooker; place on cutting board. Pull beef into serving pieces, using 2 forks. To serve, spoon sauce over beef and vegetables. Wrap up leftover pot roast in a tortilla for a quick on-the-go lunch. Customize your roast by using your favorite salsa, from pleasantly mild to as fiery hot as you dare. 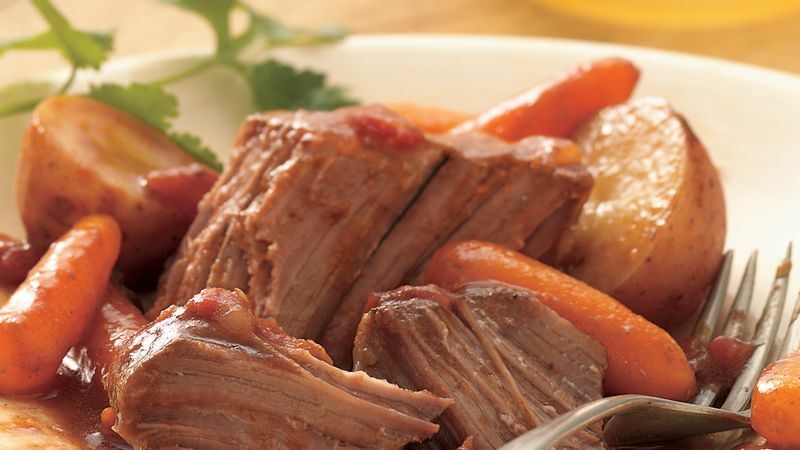 Meat in the slow cooker will become more tender the longer it cooks. At the minimum cook time, the meat can easily be sliced. At the maximum time, the meat will more easily be pulled or shredded into serving-size pieces. Add a little salsa to your favorite Italian dressing to top a salad with a southwestern accent.